Page revised in November 2015. Guidebooks to Italy are not consistent in the way they name the complex built by Cardinal Alessandro Farnese at Caprarola. Italian guidebooks including that by Giusepe Vasi, stress the importance of the palace by referring to the complex as Palazzo Farnese; French guidebooks refer to it as Château Farnese whereas English ones call it Villa Farnese, thus giving more emphasis to the gardens behind the palace. Cardinal Farnese and his guests could reach the gardens directly from the first floor of the palace where the main halls were located via a bridge, a solution which was adopted in other villas designed at a later period such as Palazzo Barberini and Giardino Colonna. The villas of the ancient Romans had a facility where the host and his guests spent the hottest hours of the day, i.e. 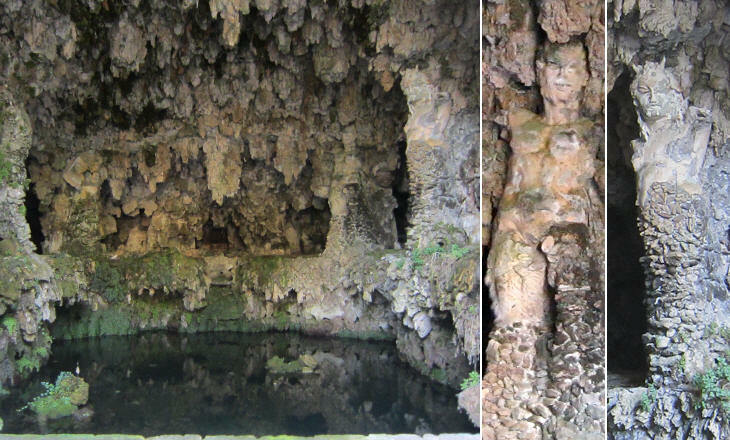 a grotto, a large artificial cave with a fountain which was often embellished with statues. In the XVIth century Ninfeo di Egeria was a widely known example of such an artificial cave. Cardinal Farnese was a great admirer of the Classical World and he asked il Vignola, the architect who designed the palace, to build a grotto in the square gardens behind the building. Roughly cut faces of satyrs peering from the rocks of the grotto were part of the scherzi (tricks) of the garden. 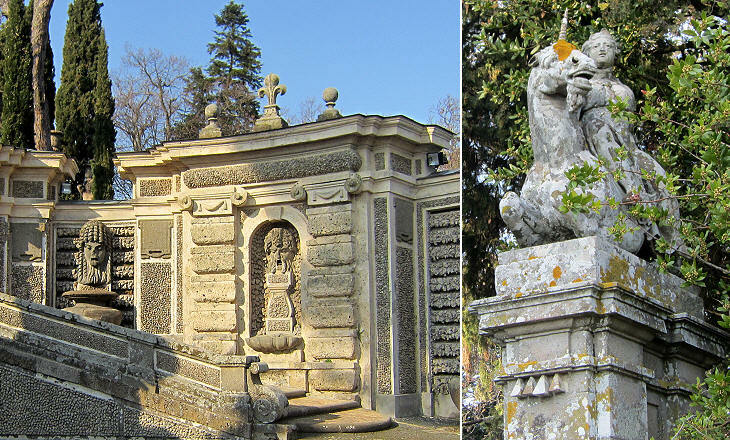 A very similar grotto was designed in the following century at Villa del Bel Respiro. 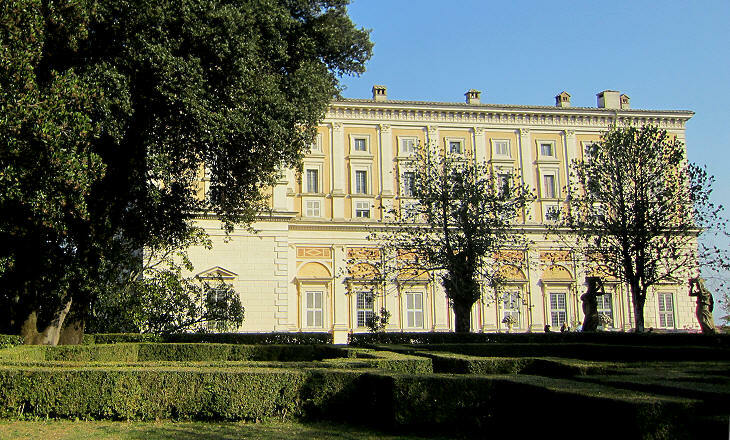 The gardens of Palazzo Farnese were designed after those of Villa d'Este at Tivoli. In the latter they are in full view from the palace which is located at their top. 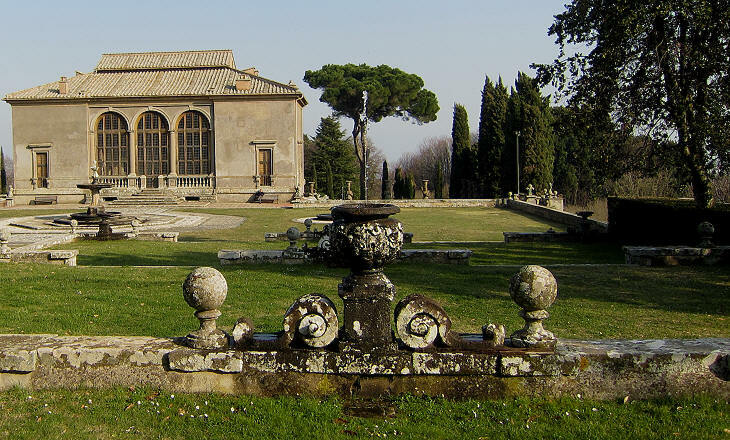 At Caprarola instead Cardinal Farnese chose to hide the main section of the gardens inside a wood of chestnut trees, very similar to those which covered the environs of Caprarola. The cardinal's guests were expected to "discover" these gardens while walking in the wood. The surprise effect desired by Cardinal Farnese today is in part diminished by the 1950s replacement of chestnut trees with larches and by the opening of a wide path across them. 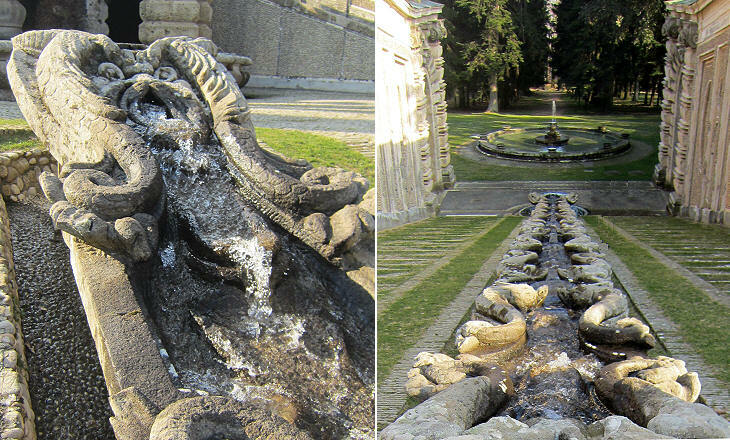 The fountain on the steps leading to a small casino resembles Fontana degli Appennini at Villa Lante di Bagnaia which was designed by il Vignola a few years after the construction of Caprarola. 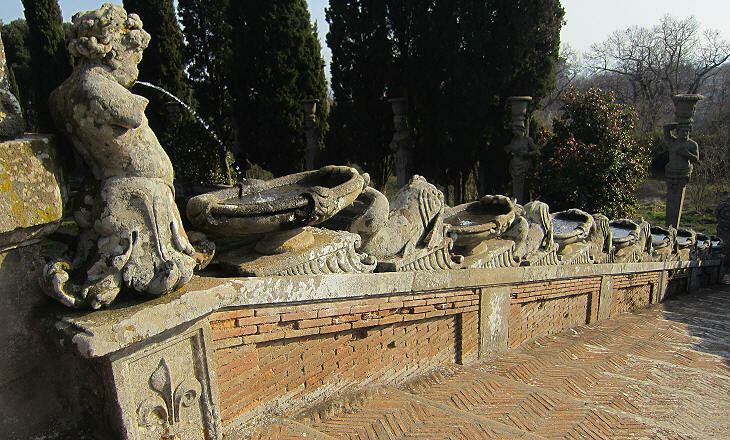 Vignola designed other gardens for Cardinal Farnese at Orti Farnesiani in Rome. This terrace is named after the caryatids which surround it; the reference to caryatids, pillars in the form of draped female figures supporting an entablature, is not correct. Giardino delle Erme would be a more appropriate name because herms, pillars with a carved head on top, were used by the ancient Greeks as boundary markers. 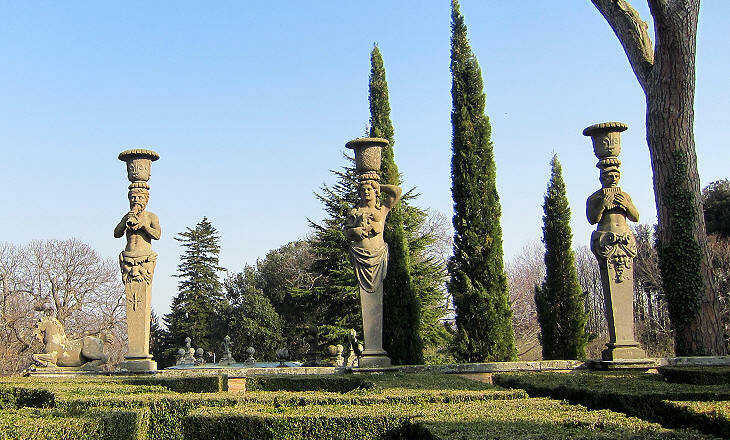 The herms of Caprarola influenced the design of the private gardens of Villa Borghese in Rome. The murmur of water falling from a low height was highly praised by the ancient Greeks and Romans and was thought to have soothing effects on the mind. This belief influenced the design of the fountains at Caprarola as well as of those at Arab hospitals, such as Bimaristan Argoun at Aleppo. 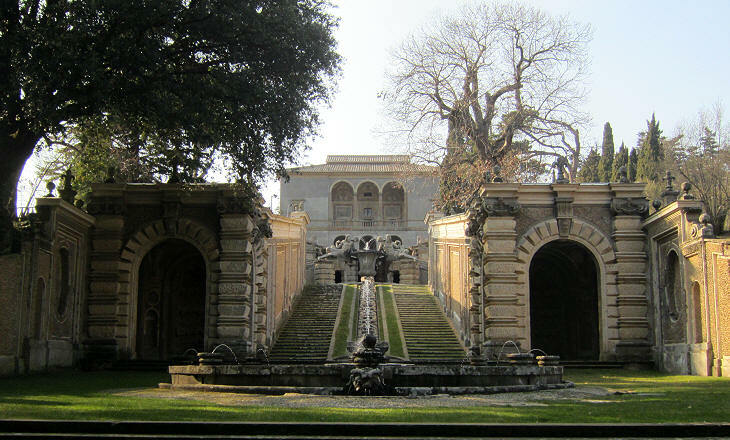 The Upper Gardens and their small casino were completed by Giacomo Del Duca after the death of il Vignola. The name given to the small casino should not be meant as a reference to the pleasures of the flesh, but to those of the mind. Cardinal Farnese befriended with many poets and in particular with Annibal Caro who gave him advice on the myths and symbols depicted in the decoration of the palace and of the gardens. Similar to Pope Pius IV at his casino in Rome Cardinal Farnese enjoyed spending his time with friends discussing poetry, art and theology. Return to Palazzo Farnese di Caprarola. Alcuni luoghi celebri ne' contorni di Roma. Alla magnificenza del palazzo corrisponde l'amenità di due giardini segreti, ai quali si passa per due ponti levatori; ed ancora la delizia di una villa con amenissimi viali, boschetti, e diversità di fontane, di scale, e fiorire ornate di sculture capricciosissime; e con un casino di ricreazione posto fra' due giardini, si rende oltre modo riguardevole questa delizia, ora del mio Sovrano il Re delle due Sicilie. E perchè è ormai tempo, che io chieda congedo al gentilissimo mio Lettore, rimetto alla savia sua condotta di passare al convento de' frati Teresani, che sta a destra, per osservare la bell'architettura della chiesa fatta dal mentovato Vignola, ed ancora li due quadri ammirabili, uno di Guido Reni, e l'altro del Lanfranchi. E se poi passando da Viterbo vorrà portarsi a vedere la famosa villa Lanti, cognominata di Bagnara, ne riceverà sommo piacere: con che resto augurandoli ottima salute ed ogni felicità.